It’s simple really. At London Encaustic, we pride ourselves on offering beautiful designs made from authentic materials that deliver on functionality, appearance and value for money. Our artisan collection of tiles and handcrafted copper baths are exquisitely designed to create a unique centrepiece in the home. We’re a small company and we like to keep it that way. All of our customers get a personal level of service that gives exemplary response times and products finished to the highest of standards. Our exclusive collection of genuine encaustic and glazed tiles comes in a wide range of patterns, shapes and surface finishes; whether you’re after oxide explosions or vintage metallic, matt terracotta or cement, we’ve got a tile for you. Alternatively, you may prefer our Zellige tiles, handcrafted in Morocco using ancient techniques. We also offer a bespoke colour simulation service to help you find the right tiles for your project. 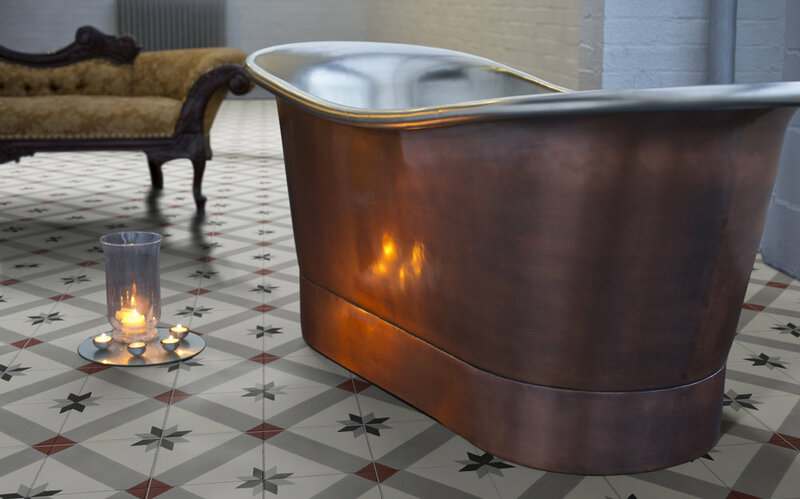 We’re also specialists in custom-made copper baths. All of our designs are crafted by hand to order; the quality and authenticity speak for themselves. If you need to know what samples are available, what gauge copper we use and what finishes are on offer, we can answer your questions right away. A luxury copper bath is an investment that will serve you well over the years. At London Encaustic, we strive for excellence. So if you’re looking to create a bathroom that is truly individual, or a kitchen that is different from the rest, then look no further. Why not make an appointment to visit our warehouse in Stapleford Abbotts where you can see our range of in-stock products? Alternatively, call us on 0208 220 3111 or fill out the contact form to find out more.